Help your students understand how to Predict Products for Single Replacement, Double Replacement, and Combustion Reactions with this resource! Use the equation cards practice identifying types of reactions, predicting products, and balancing equations! Want to decrease your prep time? Check out Predicting Products Bundle and SAVE 25% The Bundle includes this resource AND an Editable PowerPoint with corresponding interactive notebook pages! 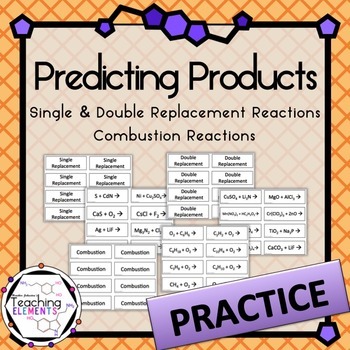 Or check out Predicting Products Puzzle Activity for more practice with predicting products of single and double replacement reactions!